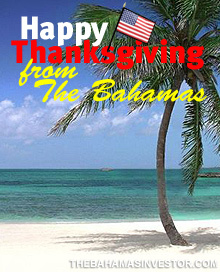 From all the staff at The Bahamas Investor we wish our American readers a very happy Thanksgiving weekend! While Thanksgiving is not a holiday in The Bahamas, we often see an uptick in visitors from our closest neighbor joining us to celebrate their holiday’s historical roots and cultural traditions. The Bahamas Investor would like to thank our US readers for helping us spread the word and make The Bahamas Investor a success. We at The Bahamas Investor think foreign direct investment is integral to the growth and diversification of The Bahamian economy and we are grateful for those who join us in the promotion of the jurisdiction. To keep up with all the information pertinent to The Bahamas Investor Subscribe to the RSS service to receive posts directly to your RSS reader or mail application, find us on facebook or follow us on twitter. The Dow just made another all-time record high. To provide some further perspective to the current Dow rally, all major market rallies of the last 113 years are plotted on this chart. Minister of Tourism Obie Wilchcombe has been in Canada recently to launch a new marketing campaign. Watch an interview with Wilchcombe here.